We catch up with ValhallaDSP founder and reverb enthusiast Sean Costello. What's your background in both music and programming? Which came first for you? "I've been playing guitar most of my life and I studied some computer music as an undergraduate, but I didn't have the technical chops to qualify for the core courses. "In the 1990s, I became obsessed with stompboxes and synthesisers, but my DIY skills in the physical realm were abysmal. I took a year-long course in computer music, and that worked for me. I got an audio DSP job in the San Francisco Bay area in 1999 and have continued to work in this field." All of your plugins so far have been based on reverb/delay. Is there any special reason for that? "I just happen to be obsessed with reverb and delay algorithms, and I keep coming up with new ideas in this space. "I've developed several hundred reverb algorithms over the last 15 years; most of them have sucked, but some of them were pretty good. It's like a tap was opened in my brain, and I'm not sure how to turn it off." 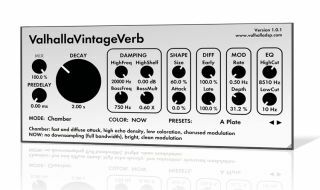 What's a good way to evaluate a reverb plugin? "If the reverb sounds good for a given piece of music, then it is good. When I'm testing my reverbs, I tend to have a dry acoustic guitar track to listen for transients and overall resonance, a dry vocal track to listen how the reverb performs on vocal waveforms, and some drum tracks. "Getting a good reverb is a balance between a smooth response to transients and a decay that is free of metallic coloration." Your interfaces are very flat and minimal with a bare-bones, no-fuss look. Why this approach? "Usability is the most important part of the interface. My goal is to create a GUI that's easy to use, quick to navigate and self documenting. "The look of my interfaces reflects my own personal tastes. I love the Swiss graphic design of the 1950s and their mutations in the 1960s and 1970s. Plus, a monitor is 2D - no matter how realistic the shading is, you can't reach out and grab that knob, A flat GUI seems more honest to me." Is add-on DSP hardware still necessary in this day and age of super-fast multicore CPUs? "I was convinced that DSPs were far more powerful than native CPUs until I started programming for my Intel Core 2 Duo MBP in 2006. I was blown away by how much power there is in modern CPUs. "I don't think that modern computers need DSP acceleration, but at the same time, DSPs are great for hardware where a large CPU would be overkill"
What's next for ValhallaDSP? Any plans to grow a "reverb beard"? "My wife has made it very clear that a beard is not in my future. Plus, my beard is starting to go grey, so personal vanity kicks in. As far as future plans, I'm finishing up AAX ports of my plugins and exploring various multirate and frequency-domain algorithms."